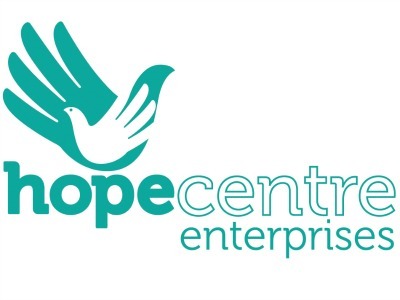 Hope Enterprises is a social enterprise and community interest company set up by Northampton’s Hope Centre, a charity, with more than 40 years’ experience working with the town’s homeless, poor and excluded. Our service delivery is a ‘hand up’ not a ‘hand out’ provision and we help our clients to move away from a life living on margins of society. We encourage them to empower their lives, so that they can engage in main stream society as active members. We try to improve the employability of people a long way from the job market affected by serious barriers of homelessness, poverty, low skills, low confidence, addictions, MH etc. We try to generate funds for re-circulation within the community we work in – ie money spent on food. We try to provide useful services to the community – cheap food for people in need, cheap, recycled tools to grow food. We strive to have an environmental impact – reducing landfill, recycling, reducing food miles, reducing food waste. We strive to improve health, reduce food poverty and reduce obesity. We promote social enterprise as a business model. We provide training, work, work experience and volunteering opportunities for the target user group. We provide cheap food, some of which we grow ourselves. Some of which would otherwise go to landfill. 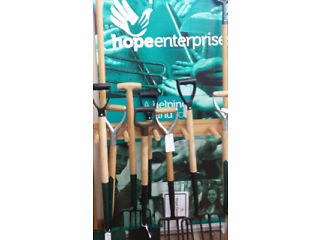 We recycle and sell garden tools. People who attend our training, volunteering or work experience obtain skills, confidence and grow in self-esteem, that make them more employable and with a greater sense of wellbeing. Some are enabled to get jobs. The community benefits by those people being moved away from dependency towards work, reducing health and offending issues and burden to those services. The environment benefits from diversion from landfill of food and tools, and growing food locally. People’s disposable income is improved by the food we supply at lower prices. We do know and will know by measuring the things listed and asking people for their feedback, as we have said. We report internally to our board. Outside people and stakeholders will know if we tell them, by issuing reports, our newsletter, using a wide variety of media, including case studies and individual stories. We hope to produce a more substantive social impact report as time and resources allow. 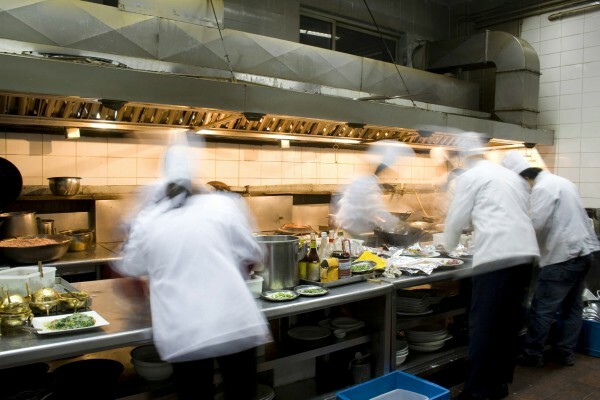 We have provided training and work experience to 34 individuals in catering in the last year which offer demonstrable improvements in skills, confidence, knowledge and employability. We have provided tool repair training to 22 people in the last year, offering the same as above. We work in Northampton only, and serve the poorest and most deprived areas of our town, including the location of our allotment project. That has offered jobs to 2 people with recent personal experience of addiction and homelessness issues and volunteering opportunities for a further 12. 142 family groups or individuals have joined food club and buy food regularly. These may vary from families with up to 5 children through to individuals. They have stated how much the project has been a lifeline to them and their families. We have given away a vast amount of goods in addition to those charged for – such as free sanitary products. Here is a link to one such story. This couple volunteer to help run the scheme. 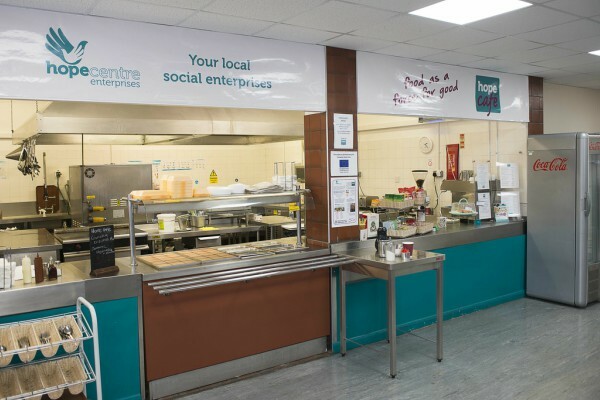 Every penny raised by Hope is spent in Northampton or creates more services for its residents. It does not benefit anyone but our service users and customers. The confidence gained by working in a supportive workplace, even as volunteers is incalculable; the sense of being involved in a project that does good for the community is of considerable added value. The foodclub pop-up shops offer a place to talk. People come in and spend an hour talking to staff, often about other issues, and meet other customers. This is a bit different to shopping at Tesco. It offers therapeutic benefits. The tool repair workshop is a sheltered workshop. People work on individual pieces for repair and get a sense of ownership and respect from being treated like valuable people, not just another human asset. People have a sense of being part of a community or team at Hope; they are not just employees in a soulless business owned by some US billionaire. We offer donations of food and other goods to employees and volunteers, which are surplus, going out of date etc . We supply a free lunch at our main site for volunteers there. We pay above the minimum wage, even if this is hard for us – but it is part of our credibility as an anti-poverty organisation. These are not relevant to a company owned by a charity and a social enterprise where employees are largely beneficiaries of charity. Staff employed by the enterprise support the parent charity. We have cited environmental benefits and employment benefits above.